The setting: An island with 4,000 inhabitants and three diesel generators to supply power. The mission: Reduce fossil fuel usage and establish a grid stabilizing energy supply based on renewable energies. The challenge: Supply a smart combination of a 2 MWp PV farm and diesel generators; introduce the largest lithium battery storage system in the Caribbean; use the latest SMA products; and develop a new monitoring platform—within the space of just nine months. To climb the second-highest mountain in the Netherlands at a height of 600 meters, we had to undertake a journey that took approximately 24 hours—from Kassel via Amsterdam to St. Maarten, and from there to St. Eustatius by propeller-driven plane. Sitting majestically above this island of 4,000 inhabitants in the Netherlands Antilles, the extinct Quill volcano is a real landmark as well as being the emblem on the flag. In its checkered history, which has been shaped by trade, slavery and piracy, the island has changed hands a recorded number of 22 times and now has the status of a special municipality in the Netherlands. On the island, also known as Statia, things have been a lot calmer over the past few decades. It is an island on which animals—particularly donkeys, cows, sheep and chickens—roam free. And now the island wants to make a name for itself with its ambitious PV hybrid project and set a green example for the whole region with this flagship project. We were already identified as newcomers by the locals while sitting on the 20-seat propeller-driven plane, and were asked about the purpose of our trip. Four flights a day connect Statia with the lifeline of St. Maarten. Of course, the primary objective of our trip was neither the archeological treasures nor the sea turtles of the marine national park, but the PV farm. Absolutely everyone on the island has heard about it. “The solar park? Yes of course, great!”exclaimed the taxi driver, which was a typical response. Two years ago, the utility company Stuco was spun off from a former group of companies, which included St. Maarten and Saba, to form an independent company. Conserving diesel fuel is expected to improve its operating business figures. The target is to use 800,000 liters less diesel fuel a year. For this purpose, the Dutch Ministry of Economic Affairs is financing construction of a PV hybrid system. In the past, eight PV system managers manually operated the three Caterpillar diesel generators with a nominal power output of between 900 kW and 1,200 kW around the clock. The employees were trained to recognize the smallest changes in frequency or inconsistencies in the operating noise of the generators, so that they could intervene at lightning speed. The genset system is now set to be complemented by a PV farm and a battery storage system. To optimally combine these different energy sources, at SMA Sunbelt Energy GmbH we focused on the system design. Despite the more complex system layout, it is designed with automatic operation and low maintenance in mind. During our planning and production phase in Kassel, our local partner Eco Energy worked from September 2015 to February 2016 on construction of the 1.89 MWp PV farm. The Sunbelt team in Kassel followed the construction progress live via camera links. To withstand the frequent barrage of hurricanes in the Caribbean without sustaining any damage, extremely pressure-resistant PV modules by Suntech were used on a frame produced by Schletter. The 73 SMA Sunny Tripower 25000TL-30 PV inverters were installed in containers to protect them against corrosion from the sea air. 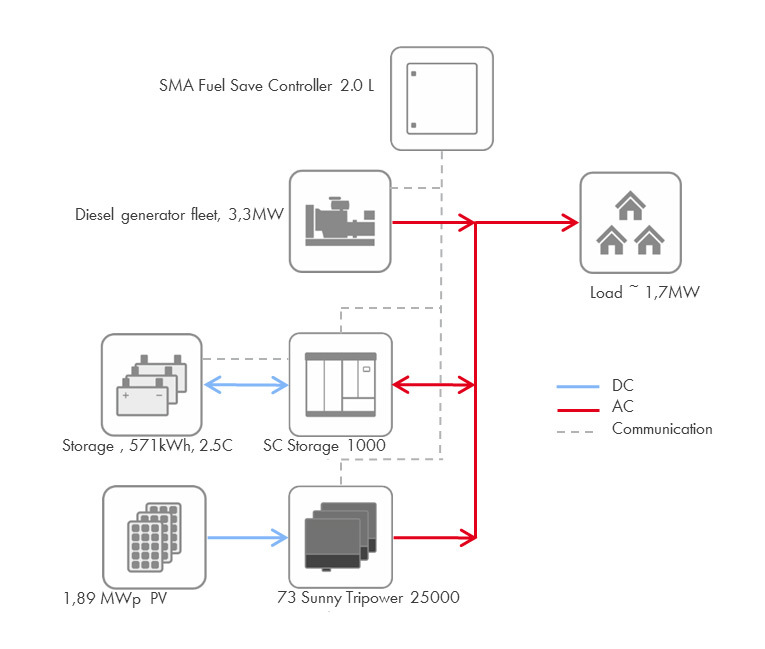 SMA Sunbelt Energy GmbH was responsible for the overall technical design and on-time delivery of the large-scale storage system, the battery inverter including MVPS as well as the monitoring and control system. The components used included the new Fuel Save Controller and the Sunny Central Storage 1000. Designing the system was made a lot harder by a lack of data on solar irradiation and cloud movements. The battery power of 1 MW and charge rate of 2.5-4C mean that the system is designed for the worst-case scenarios. We have seen battery inverter power outputs of up to 800 kW when the system is in operation, which means that the impact of cloud movement is much greater than we originally thought. But high-performance and flexible energy management can safely offset these extreme step loads. PV penetration is 89%. This means that 89% of the power consumption of around 1.7 MW is covered by solar power. By way of comparison, without a storage system PV penetration of 60% was classed as a very good value. The first week of commissioning went without a hitch. One of the most exciting moments was the first time the battery was discharged into the utility grid via the Sunny Central Storage. This was followed by system functionality tests to check the interaction between the diesel generators and the Fuel Save Controller. Over the course of these tests, we simulated step loads and ramps by connecting and disconnecting the generators. The commissioning process took just 10 days in all. The system functioned perfectly right from the first moment it was switched on. We were excited, especially because this gave us extra time for a Sunday excursion to Quill National Park. In the volcanic crater of the park, we discovered the local wildlife and wild banana trees. This experience served to remind us once again for whom and for what we commissioned this sustainable power supply in the first place—not only for our client Stuco, not only for the 4,000 inhabitants living on the volcanic island, but also to preserve this remarkable flora and fauna. Thank you to all project members, partners and suppliers who made this project a success and turned it into the flagship project of the Caribbean. If you are planning similar projects or have any questions, please write in the comments box or to Sunbelt@SMA.de. We look forward to hearing from you. SMA Sunbelt Energy GmbH is a 100% affiliated company of SMA Solar Technology AG headquartered in Germany. The company was founded in 2014 and focuses on off-grid, solar hybrid and battery-based projects. SMA Sunbelt offers SMA’s off-grid components to international clients and additional services including customized turnkey installations of PV-Diesel hybrid and battery based applications. Wiebke is an industrial engineer and has been working at SMA Sunbelt Energy GmbH since 2015. In her role as project manager, she handles international PV diesel hybrid projects, some of which are based in remote regions of the world. The amateur photographer makes the most of her trips to project locations to capture the countries and their people, as well as some exotic flora and fauna, through her camera lens. — How does the SMA Fuel Save Solution work?